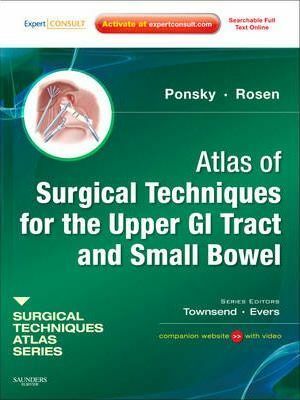 "Atlas of Surgical Techniques for the Upper GI Tract and Small Bowel", by Drs. Ponsky and Rosen, presents state-of-the-art updates on the full range of surgeries for the upper GI tract and small bowel performed today. This title in the new "Surgical Techniques Atlas" series edited by Drs. Townsend and Evers offers you expert advice on a variety of techniques - open and interventional - to help you expand your surgical repertoire and hone your skills. Full-color illustrations and photographs enhance visual guidance and Expert Consult functionality gives you easy access to the full text online at expertconsult.com.